Mr Fan has more than 40 years of experience in construction and structural engineering. 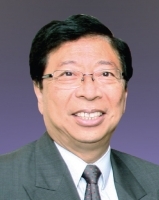 He has been Chairman of the Joint Structural Division of The Hong Kong Institution of Engineers. He was honoured with the Distinguished Alumni Award by the Department of Building and Real Estate and the Department of Civil and Environmental Engineering of PolyU in 2012, and the Outstanding PolyU Alumni Award in 2013. Mr Fan is currently a member of the PolyU Court and a board member of the Federation of PolyU Alumni Associations.